There was an interesting Rules situation at my own Club a few weeks ago. Following a summer gale, two large branches were blown down from a mature tree on the course. One branch was hanging down from the tree and the other was completely detached and lying on the ground. It happened overnight and a mid-week semi-open competition was under way before the greenkeeping staff could remove the branches and before the Committee could consider whether the immediate area should be marked as temporary ground under repair. Q. 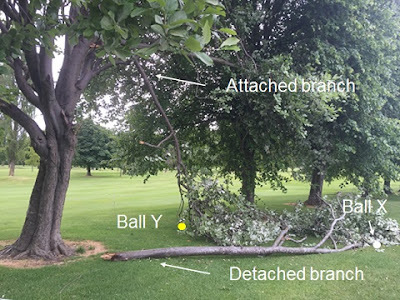 If part of a large branch which has fallen from a tree (and thus is a loose impediment) interferes with a player's swing, may the player break off the interfering part rather than move the whole branch? So, in the photo above, the player of ball X may remove all of part of the detached branch lying beside their ball, providing they can do so without causing their ball to move. The situation with the branch that is still attached to the tree is different. Rule 13-2 prohibits a player from improving their intended stroke by moving, bending or breaking anything growing. Because the branch is still part of the tree it is deemed to be growing. This is the case even if a branch is dead and still attached to a tree. Q. Is a fallen tree a loose impediment? A. If it is still attached to the stump, no; if it is not attached to the stump, yes. I cannot see or hear the name, Whistling Straits, without being reminded of the penalty that Dustin Johnson incurred when grounding his club in one of the 1,000+ bunkers on this rugged course, which probably cost him the PGA Championship, 5 years ago. Click here for a reminder of his breach. I understand that the area that contained the infamous ‘non’-bunker is now covered by a corporate stand! If only it had been there in 2010! As you watch the 2015 PGA Championship unfold, be aware that Whistling Straits is the host venue for the 2020 Ryder Cup matches. Those of you that make book purchases through Amazon will know that you can write a short review against the title. I would be grateful if anyone that has purchased my '999 Questions' book (and found it useful!) would write a short review to help others that may be considering purchase. Click on this Amazon link page for the paperback version.